THE Buckle of the Girdle of Isis was worn to obtain the Good Will and Protection of this goddess, and symbolised "the blood of Isis" and her strength and power. Frequently made of Carnelian it was believed to protect its wearer from every kind of evil; also to secure the good will of Horus; and, when placed like the golden Tat at the neck of the dead on the day of the funeral in the soul's journey through the under-world it opened up all hidden places and procured the favour of Isis and her son, Horus, for ever and ever (see Illustrations Nos. 71, 72, 73, Plate V). The Tie, Or Sa (Illustration No. 70, Plate V) is the symbol of Ta-urt, the Hippopotamus-headed goddess, who was associated with the god Thoth, the personification of Divine Intelligence and Human Reason; it was worn for magical protection. The Scarab was the symbol of Khepera, a form of the Sun god who transforms inert matter into action, creates life, and typifies the glorified spiritual body that man shall possess at the resurrection. From the enormous number of Scarabs that have been found, this must have formed the most popular of the Talismans. The symbol was derived from a Beetle, common in Egypt, which deposits its eggs in a ball of clay, the action of the insect in rolling this ball along the ground being compared with the Sun itself in its progress across the sky; and as the ball contained the living germ which, (under the heat of the Sun,) hatched out into a Beetle, so the Scarab became the symbol of Creation. It is also frequently seen holding the disc of the Sun between its claws, with wings extended, and it is thought by some authorities that the Scarab was taken as an emblem of the Sun, because the burial of its ball was symbolic of the setting sun from which new life arises with each dawn. Scarabs of green stones with rims of gold were buried in the heart of the deceased, or laid upon the breast, with a written prayer for his protection on the Day of Judgment, whilst words of power were frequently recited over the Scarab which was placed under the coffin as an emblem of immortality so that no fiend could harm the dead in his journey through the under-world. It is said the Scarab was associated with burial as far back as the IVth dynasty (about 4600 B.C. ); it represented matter about to pass from a state of inertness into active life, so was considered a fitting emblem of resurrection and immortality, typifying not only the Sun's disc, but the evolutions of the Soul throughout eternity. It was also worn by the Egyptian warriors in their signet rings for Health, Strength, and Virility, it being thought that this species of Beetle was all males, so that it would attract all manly qualities, both of mind and body. For this reason it was very popular as presents between friends, many scarabs being found with good wishes or mottoes engraved on the under side, and some of the kings used the back of scarabs to commemorate historical events; one in the British Museum records the slaughter of 102 fierce lions by Amenhetep III, with his own hand (see Illustrations Nos. 74, 75, Plate VI). Next to the Scarab, the ancient Egyptians attached much importance to the Eye Amulet, which, from the earliest Astral Mythology, was first represented by the point within the circle © and was associated with the god of the Pole Star, which, from its fixity, was taken as a type of the Eternal, unchangeable as time rolled on, and thus a fitting emblem of Fixity of Purpose, Poise, and Stability. Later it was one of the hieroglyphic signs of the Sun god Ra, and represented the One Supreme Power casting his Eye over all the world, and instead of the point within the circle is sometimes represented as a widely open Eye. This symbol was also assigned to Osiris, Isis, Horus, and Ptah; the Amulet known as the Eye of Osiris being placed upon the incision made in the side of the body (for the purpose of embalming) to watch over and guard the soul of the deceased during its passing through the darkness of the tomb to the life beyond. It was also worn by the living to ensure Health and Protection from the blighting influence of workers in black magic, and for the stability, strength, and courage of Horus, the wisdom and understanding of Ptah, and the foresight of Isis. 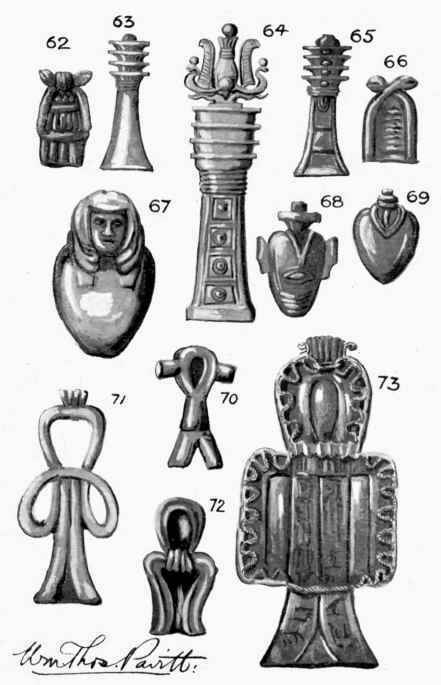 Examples of Eye Amulets are illustrated on Plate VI, Nos. 79, 80, and 81. When two eyes are used together the right eye is symbolic of Ra, or Osiris and the Sun; whilst the left eye represents Isis, or the Moon, and is sometimes called the Amulet of the two Utchats: the word Utchat, signifying "strength," being applied to the Sun when he enters the summer solstice about June 22nd, his strength and power on earth being greatest at that time.